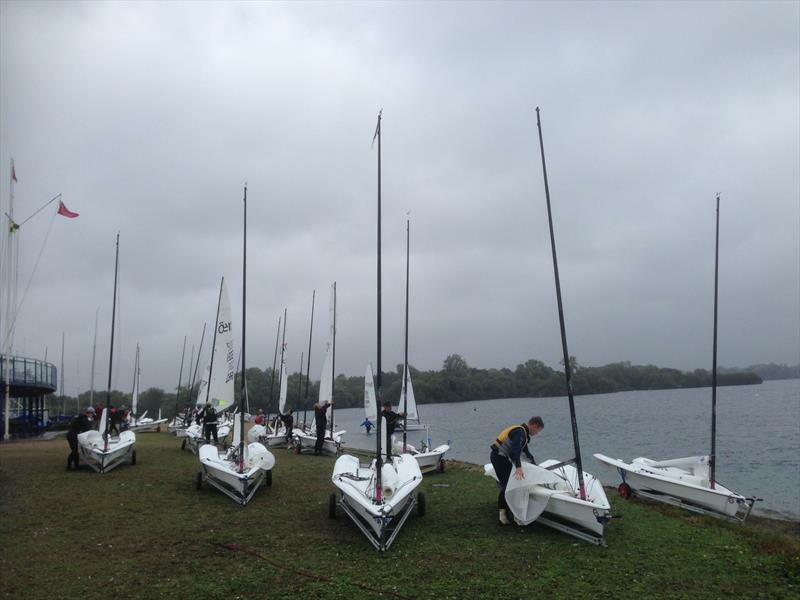 Saturday 10th September dawned somewhat grey and damp but that didn't affect the spirits of the RS Aero fleet at Burghfield. The strong home fleet was complemented with many of the usual suspects, but also several new faces including new additions to the fleet from Rickmansworth and Bexhill in their sparkling new RS Aeros. With 23 RS Aeros and 6 races providing a packed schedule the 9's were given a separate start. The race officer cunningly set Inner and Outer loop trapezoid courses with the RS Aero 7 and 5 fleets starting first and going over to the outer side keeping the 2 fleets nicely separated whilst 9's to do inner loops. 30 minute races proved ample with many race opportunities to be had during that time! First race with the wind a teasing shifty force three Ben Rolfe used his local knowledge to take the win from Gareth Griffiths (Island Barn) and Matt Thursfield (Chelmarsh) with Peter Barton (Lymington) in fourth. These four would contest the podium, though Ben was also to be pushed hard by his dad, Nigel’s, late charge. Race 2 was tight at the front with Gareth and Peter contesting the lead until Gareth showed once again that maths graduates can't count and led the fleet towards the wrong mark . Most of the fleet followed to do an extra loop lap, but Matt Thursfield and Mike Lyons (Burghfield) spotted the error to take first and second while Peter and Gareth recovered to third and fourth. The fleet then adjourned to the clubhouse for Burghfield's excellent food. After lunch the RO worked hard wasting no time between races to get four races in while the wind slowly shifted right briefly blew up then eased slightly to give everyone a chance. Race 3 and Peter Barton started to show his usual form taking the win from Gareth with Peter Chaplin (Burghfield) third. Race 4 Ben took another win closely pursued by Peter and Gareth with the top places changing each lap. Races 5 and 6 and Peter stamped his authority on proceedings with two bullets but behind him it was very close with Matt eventually taking second overall by one point from Gareth - what of the battle of the Rolfes you ask - Nigel came to the fore in the last two races with a couple of seconds to tie on points with Ben just off the podium. Bragging rights shared in team Rolfe - Ben ahead with two 1st places after discard but Nigel with the lowest total points. Archie Hainsworth (Alton Water) continued his winning streak in the RS Aero 5s following up his European and National titles with a win at Burghfield, clinching the top Youth (U19) accolade too. He did not quite manage to have it all his own way though, with Cathy Bartram (Chew) taking the win in Race 2 and top Lady, with Burghfield offering up ample racing challenges and opportunities throughout the day to keep everyone on their toes. Rounding out the top 3 and also first Junior (U16) was fleet newcomer Felix Scheidt (Bexhill). By the time we had launched there was a good medium breeze, but also with 20 degree shifts changing things up as usual on most ponds. With big shifts up the first beat, it allowed 4 boats to get away in Race 1. David Cherill (Broadwater), Andrew Cooney (Broadwater), Andy Hill (Hayling) and Karl Thorne (Lymington) with them all finishing within seconds of each other in the respective order. There were a couple of sailors a little two eager in Race 2, me being one of them, with an individual recall. Once all had cleared the line, the racing was once again tight but David managed to come out on top followed by Chris Harrup (Burghfield) and Andrew in 3rd. Once we had filled ourselves with fantastic food from the galley, it was out for a slightly breezier afternoon’s racing. In Race 3 three boats, David, Andy and Ben Webb (Rickmansworth) managed to get away from the rest of fleet. Positions stayed in this order until the end of the race. For Race 4 it was looking like it was going to follow the formation of all the other races so far. However an even more shifty than usual final beat allowed Jack Hardie (Frensham) through to take the win followed by Chris and then David in 3rd. However in Race 5 it was back to normality with David opening an un-catchable lead and now being mathematically unassailable. Down the last run Jack managed to get past Chris, meaning whoever beat who in the final race would take 2nd overall. The last race started and looked like it was all over before the windward mark, with Jack rounding towards the back and Chris right at the front of the leading pack. However, throughout the race Jack made his way through the fleet and it became very close towards the finish with Chris hanging on to take 2nd from Jack in 3rd (and 1st in U22s). After the discard was calculated, David Cherill took the 7’s only counting race wins. A great set of results, despite it being mentioned at the prize giving that maybe he should have been with the 9’s – but well done to him for beating the lightweights! In his speech, he thanked everyone from the club that had made the day, from the admin team to the galley, which was echoed by all of us. A great event and hopefully we will see even more boats next year. Burghfield was Round 3 of the 6 event RS Aero UK Southern Circuit. Next up on the Circuit is Brightlingsea on the east coast this weekend, 17/18th Sept, followed by the Inland Champs at Chelmarsh on 15th October and the RS Classes ‘End of Seasons’ at Rutland on 5/6th November. The later two also combine as the last two events of the UK Northern Circuit, where north meets south!